Tokyo, August 6, 2014 - Fuji Heavy Industries Ltd. (FHI), the manufacturer of Subaru automobiles, today held a completion ceremony of the Ebisu Subaru Building, its new corporate headquarters in Tokyo, prior to the relocation from Nishi-shinjuku, Shinjuku-ku to Ebisu, Shibuya-ku scheduled for August 18. The all-new facility will enhance the FHI office environment and allow more active internal/external communication. The design of the Ebisu Subaru Building features a sense of "speed" and "dynamism" like those felt with automobiles. Externally and internally, the building incorporates dynamic horizontal motifs evocative of the Subaru spirit. While providing open spaces with few pillars, the new building is equipped with active communication hubs housing shared areas and functions, including office equipment and meeting nooks. Digital signage displays a variety of internal and external information aimed at invigorating communication among employees. A range of eco-friendly technologies reduces energy expenditure to optimize building lifecycle costs: energy consumption for services including air conditioning, lighting, and hot water supply is approximately 40% lower than in a typical office building*. The building is also designed to facilitate business continuity in times of emergency, featuring seismic isolation technology and emergency generators to ensure that key head office functions can be maintained at the time of a major disaster. In addition to housing the corporate headquarters, the building will serve as a base to deliver FHI/Subaru messages, with Subaru models on display in the 1st floor showroom enhancing Subaru's brand message communication. The "EBiS 303" event hall on the 3rd floor, with a maximum capacity of 1,200 people, will be used for new vehicle launches and other events. FHI will take the relocation of its corporate headquarters as an opportunity to strengthen its competitiveness and business structure to achieve further growth. *Comparison conducted by FHI based on standards applying under Japan's Act on the Rational Use of Energy. 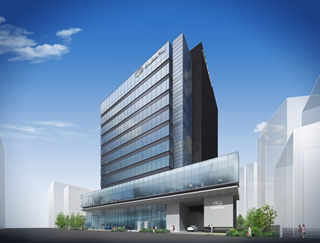 FHI New Headquarters "Ebisu Subaru Building"